I may be cheating a bit here, but I wanted to continue my NOLA theme for Cook the Books. Simone from briciole is hosting and chose Twain’s Feast by Andrew Beahrs for this round. As soon as we returned from our Spring Break trip, I reread the New Orleans chapter. Twain’s early days in New Orleans begin with his arrival with little more than $9 in his pocket and an ambition to become a river boat pilot on the bustling Mississippi. Beahrs continues to trace Twain’s later voyage, not as a pilot, but as a passenger down the river when river boats were becoming an antiquated form of transportation. Twain describes the Mississippi as “a wonderful book…which told its mind to me without reserve, delivering its most cherished secrets as clearly as if it uttered them with a voice” (185-86). I wonder if Twain viewed New Orleans in the same way, as a city with a wonderful story to unfold to people in tune enough to hear her secrets. Beahrs gets “deep in the woods” with sheepshead and croaker, two forgotten forms of seafood that Twain would have eaten. Sheepsheads are ugly critters. Croakers, on the other hand seem a bit daintier and, according to Beahrs can be fried whole. 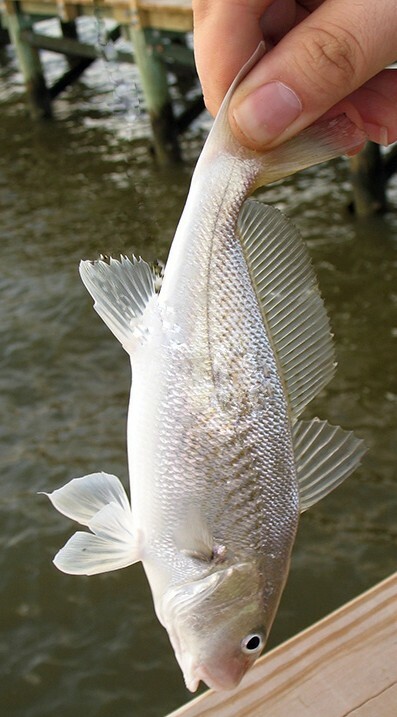 In Twain’s day, these fish were on even some of the finer menus in New Orleans and were even served at Antoine’s. These “trash” fish fell out of favor and only recently are reappearing on menus because of the sustainable harvest movement. Even though I am not a big seafood eater (though I developed an affinity for fried oysters on our recent trip), I was dying to seek out some sheepsheads to bake up or some croakers to fry crisp. I really wish I had sought these out to try in NOLA but I was eating my fill of po’boys and oysters. Instead of funny looking fish, I still had beignets from Cafe du Monde in my head and I wanted to do a traditional New Orleans food. 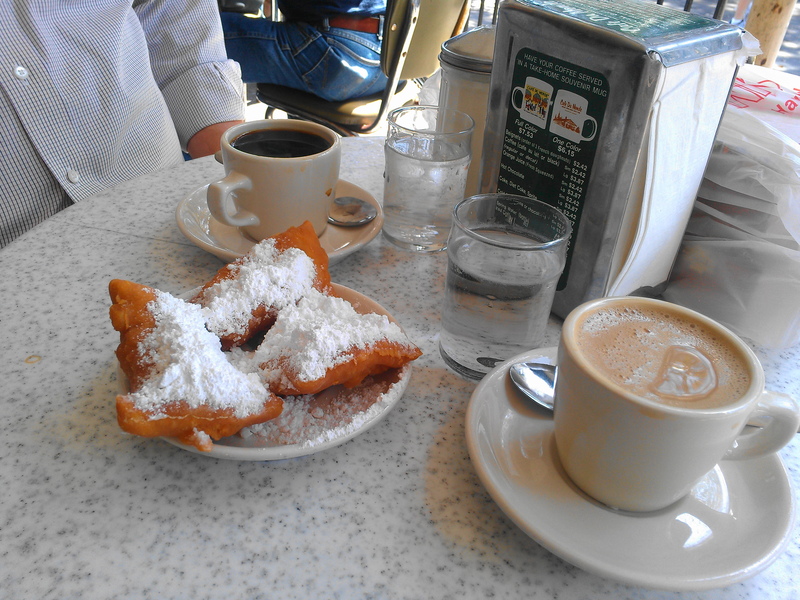 The original: Beignets from Cafe du Monde with a Cafe au Lait and chicory coffee. I could not believe the amount of powdered sugar. It was everywhere! The Hubs wondered if I could make them. Of course, I said. I pulled Jambalaya, a New Orleans Junior League Cook Book, from the shelf as soon as we got home and tried to whip up a batch to oblige. In the bowl of a stand mixer, dissolve yeast in warm water. Let set for five minutes. In a smaller bowl, whisk together half & half, egg, vanilla, oil, sugar, salt, and nutmeg. Add to yeast mixture and stir. Add the dough hook and mix in flour, working in a fourth of the flour at a time. Dough will be sticky. When dough forms into a ball, place it on a heavily floured surface. Cut dough into fourths and roll out 1/8 inch thick. 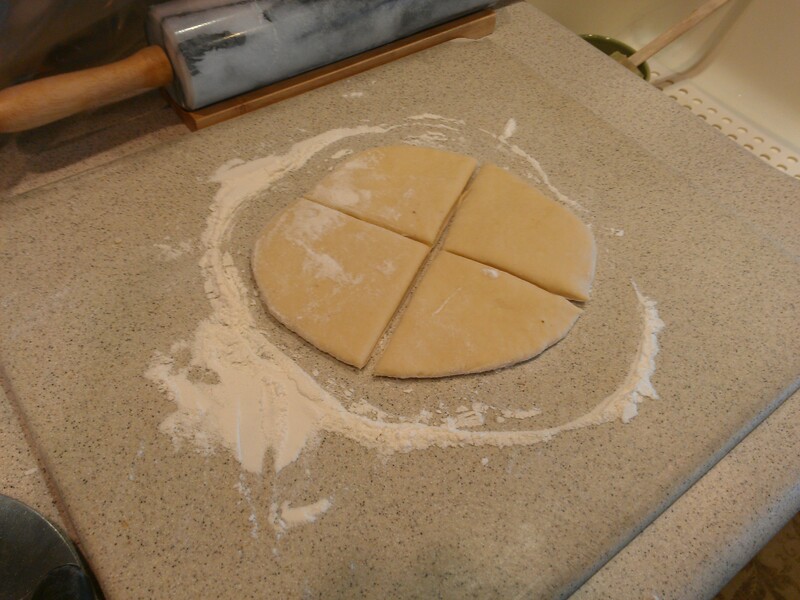 Cut each circle of dough into fourths. Drop beignets a few at a time into hot oil (370 degrees). 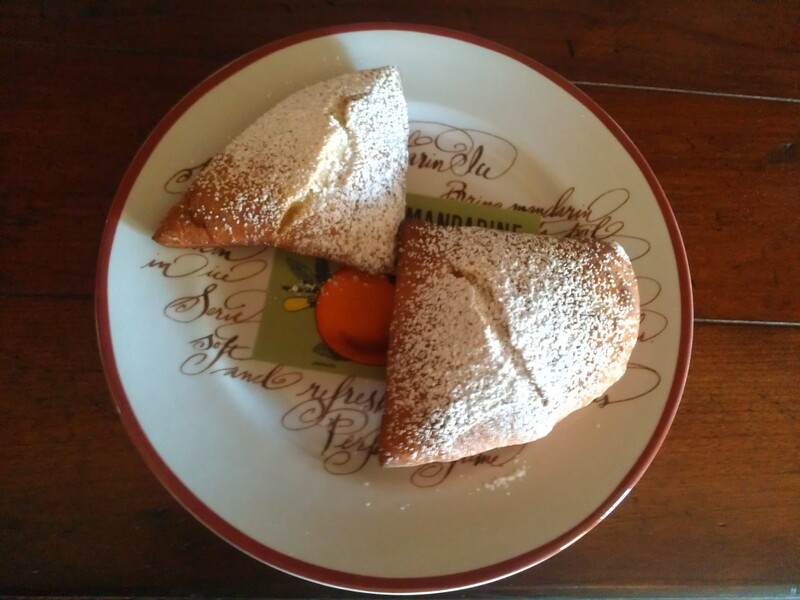 As beignets rise to the sruvace and puff, turn them over to brown other side. Remove from oil and drain on paper towels. Dust with powdered sugar (a little or a lot) and serve warm. My version from Cafe du Eliot. Mine weren’t quite as light as Cafe du Monde’s, but I think I rolled them out too thick. The original recipe states that the unused dough could be refrigerated for up to one week. I only fried up half the dough and froze the rest for another weekend’s breakfast. I hope the dough freezes well. I like to believe that Twain enjoyed some of these powdery sugar treats before one of his voyages up the Mississippi. I enjoyed the book but I found that Beahrs sometimes wandered a bit off topic for me. Maybe that was necessary as he rediscovered (or tried to rediscover) Twain’s favorites. The process took him to the tall grass prairie to see booming prairie chickens, the Mississippi Delta, and New England cranberry bogs just to name a few places. Does he become that “freaky Twain guy” as his wife predicts at the beginning of his quest? Perhaps he does, but Beahrs is fulfilling a passion and is another author that is prodding us to think about sustainability, local eating, and the history of our American meals. Join the group for the April/May selection: Funny in Farsi: A Memoir of Growing Up Iranian in America by Firoozeh Dumas (2003). Rachel is hosting this memoir by an Iranian-born author who emigrated to southern California with her family in 1972. These essays chronicle her cultural adjustments and embarrassing family issues. There is lots of food and lots of laughter found here. Posts are due on June 1. Fried stuff are usually very tasty and addictive. 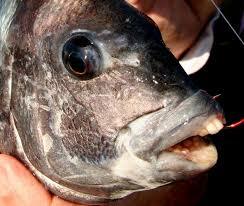 Have never had or seen sheepshead before..a fun name for fish. Yep, if you don’t like something, try it fried. That sounds like a very interesting book. I’m very fond of checking how authors use food in their literary works, but it’s also fun to cook them. And, what insight into Mark Twain. Love seeing the photos from your travels. I think the croakers really are much daintier than I thought. And you should let everyone know that you are now one of the fabulous cohosts of Cook the Books! We are lucky to have you. Yes, I totally spaced on putting in the cohosting gig (of which I am very excited and proud!!!!). Rushing around too much, I guess. Thanks for mentioning it, Rachel. I am totally impressed that you bade Beignets. And it makes me wish I were sitting at Cafe du Monde getting powdered sugar all over everything. And the book sounds interesting. Book is great. Would definitely recommend it! Thanks. Most of mine are hanging on a wall. Lucky Girl! I love NOLA like just about no other place on earth! we usually get ours in a paper sack because we can continue to shake the powdered sugar over them as we eat – it IS everywhere! 🙂 As soon as I finish eating them I walk across to church and pray I am forgiven for being gluttinous! Love the gluttony and repenting idea. Think there is a lot of that going on in this town. You brought back some good memories of a trip to New Orleans years ago. I remember being served a big plate of those beignets along with a cup of chickory coffee. So, for an update, the dough freezes well!!!!! I was wistful this morning for some chicory coffee, though. I would never say no to your beautifully puffed and sugared beignets! I’ve spent a lot of time fishing in the south, but I don’t remember these two fish. We caught a lot of bluegill and catfish. Good for you for tackling beignets!! I love the one’s at Cafe du Monde and I’m sure I’d love eating a few of yours as well. I’ll take 3 with a cup of cafe au lait, please. What a fun post and great recipe. I just can’t bring myself to fry things. This might change my mind. One of these days I will get to NOLA–your posts have been fun to read. I am with you, those sheepsheads are pretty homely. I think I would stick to those croakers if I had to prep them. 😉 Your Cafe du Eliot beignets look amazing. I would love a plate with a big cup of hot coffee–chicory optional. Thanks, Deb. I love the vibe of NOLA. Stay tuned for some more travel tales. Lively post, as usual. I hope your efforts were appreciated. If I ever visit New Orleans, I will certainly check out the place and its famous beignets. Thank you so much for your contribution to Cook the Books. Thank you for hosting. I enjoyed the book and have recommended it to many. A large cup of coffee and a plateful of those and I would be a very happy woman! Would you like some chicory in that coffee? I love beignets and luckily there’s a local restaurant whose owners are from NOLA that make them. The kids love them and it’s worth getting covered in powdered sugar! You are lucky to have a beignet supplier close to you! Last night we actually found a food truck that serves traditional beignets, stuffed beignets, cafe au lait and chicory coffee! You are the lucky one. Beignets have been on my foodie bucket list for some time, as well as visiting Café du Monde and New Orleans. 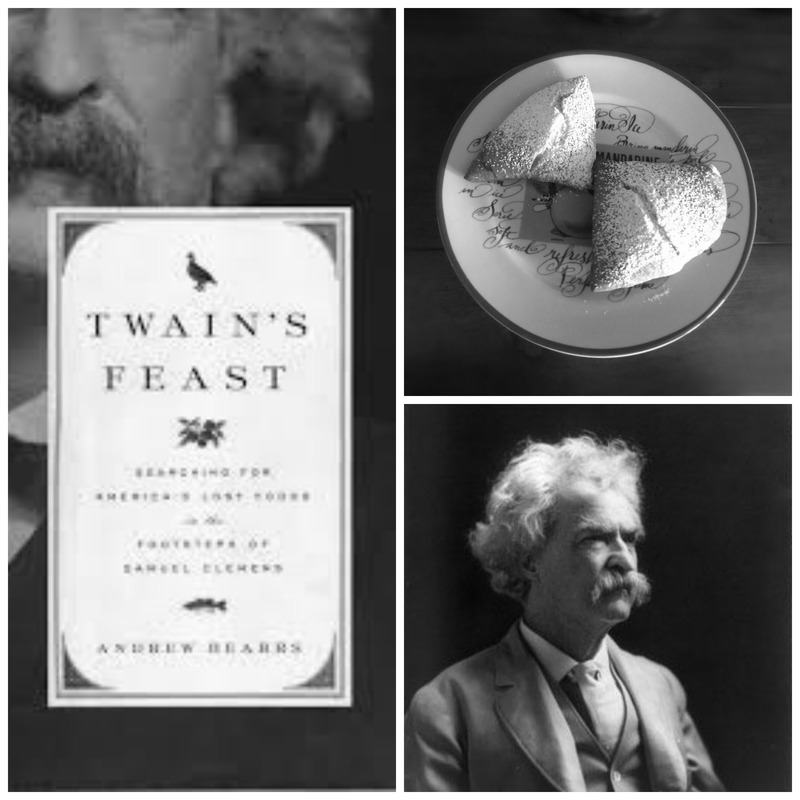 How cool that we both prepared beignets based on Twain’s Feast. I LOVE the powder sugar coated sweet ones from the Cafe du Monde, brings back great memories. In mine I went for something savory.